In 1749 a proposal was made by the commander of the Toulon dockyard to build four chebecs as an effective protection against the Barbary pirates. The corsairs primarily relied on fast and agile chebecs, while the frigates and sloops-of-war of the French navy proved ill-adapted to fight them. So it was logical to confront them with the same type of ships. The chebecs were shallow-draught vessels with concave waterlines in the bows and sides sloping outwards. They were rigged with lateen sails on all three masts and carried 20 - 40 guns. The chebec Le Requin was built in 1750 - 1751 by Majorcan shipwrights at the Royal Dockyard in Toulon for the French navy. She was launched on 14 March 1751. Her crew were 220 men, her armament were twenty-four 8-pdr-guns. She was to show excellent sailing qualities and served in the French navy until 1770. A more detailed history, plans and photos of a contemporary model are shown in a book by Jean Boudriot. In May 2012 I found the contemporary model on display in the Musée de la Marine in Paris. This ship model was built to plans by Jean Boudriot. The sails are clewed like when the ship dropped anchor, before the sails were tightly furled. 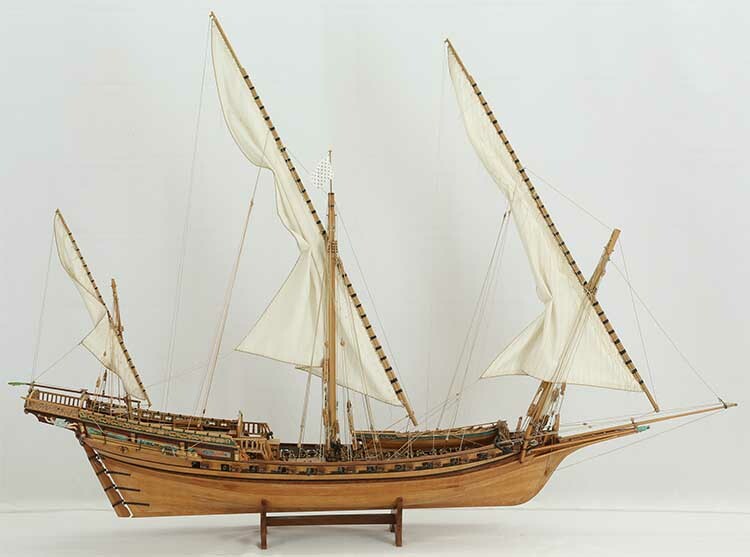 The model was made by a very experienced ship modeler who was well versed in carving and painting the decorations. This model of the Le Requin is a very rare, fine piece of work, a true masterpiece. The model is 1 : 52 scale. Length is 111 cm, width 28 cm, height 86 cm. There are two stands for the model. A larger one with decorative wooden intarsia, and a simpler one made from plum tree. 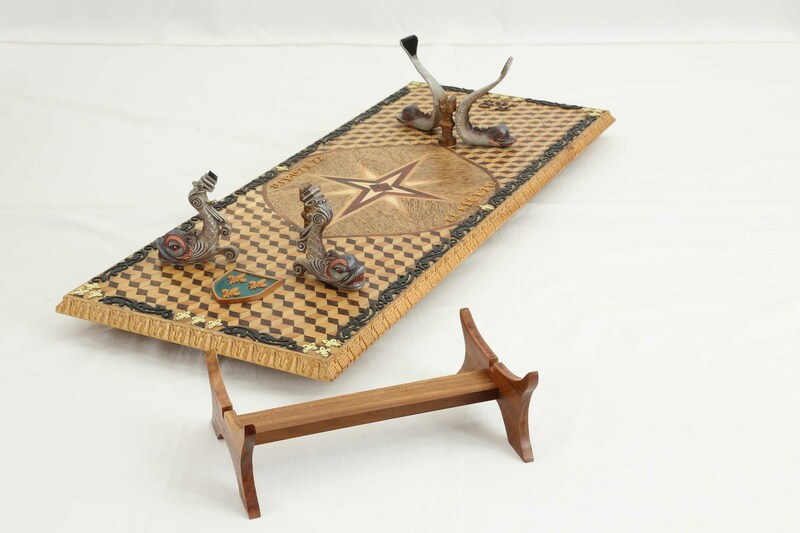 Both can be used depending on taste and the furniture the model will be placed on. The ship can be taken out of the stands, e.g. for transport. The price of the model is 9500 Euro, plus transport cost.